On the Trail of a Red-Tailed Hawk! A couple weeks ago, Vertica moved into our cool new space in Cambridge, MA. I’d been eagerly awaiting the commute; a scenic bike ride along the Charles River. I didn’t expect nature to follow me all the way up to the 9th floor, though. So imagine my excitement when, on our first day, a magnificent red-tailed hawk swoops down and lands right on the window ledge! We’re at the top of the tallest building around, so I guess the ledge works well as a cliff. 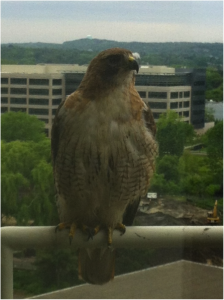 The hawk has become a regular visitor, and the unofficial Vertica mascot. After all, it’s Simply Fast. As much as we’d like to sit there waiting for it to show up all day, we all do have work to get done. So I figured  why not put a webcam next to the window to analyze its habits and and be alerted when it shows up. And with Vertica 6, that’s easy! As it turns out, I’ve been working with the Vertica SDK team on User-Defined Load (UDL), a collection of SDK APIs that lets you ingest data in any arbitrary format from any arbitrary source. Loading files and tables is pretty dull, so instead, I’ll use Vertica to track our mascot! In this blog, I’d like to show you how I did it. The first step is to get Vertica to read data not from a file, but from a webcam. For this, we will need a User-Defined Source. UDSources are a part of the UDL SDK. As far as Vertica is concerned, all they do is emit data. They could get that data from anywhere: A file, a remote server, a webcam (! ), an API call into a special service; they could even make the data up. Note the ORDER BY clause. This is a Vertica extension that tells Vertica how to keep the data sorted. This is the order that the data will come sorted in; we might as well keep it that way so that Vertica can search through it faster. And if I have a frame where the image suddenly gets darker, I know the bird has flown in. If I want, I could easily do analytics on a window of the data; look for images where one part of the image changes more than others; even write a UDF that does proper object recognition. Pick out if the hawk is eyeing its prey or snacking on a rodent (which it has done more than once). But this turns out to be good enough for us here in Cambridge!